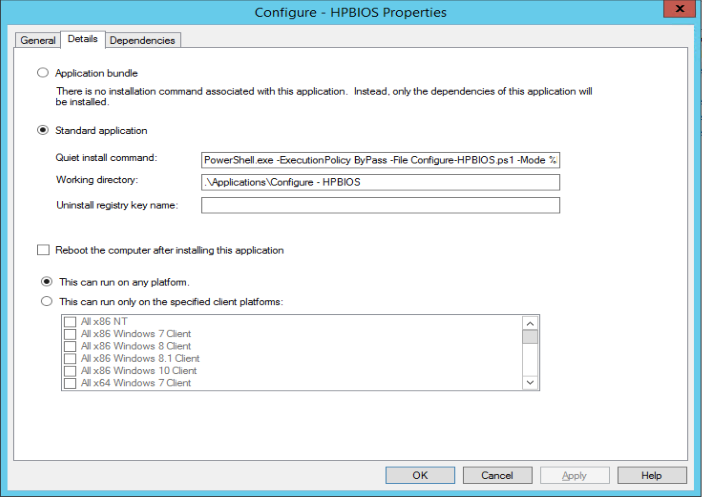 If you have a HP ProLiant Gen 8 or Gen 9 it is possible to use PowerShell to configure the BIOS. One of the items I really like to configure is the Power Settings, in most cases you would like to have “performance” but the default setting is usually set in “Tree Hugging Mode” (also called power saving). This is especially true if server is going to be used as a Compute server (running Hyper-V). Write-Output "$ScriptName -  Selected Mode: $Mode"
Write-Output "$ScriptName - HP PowerProfile is set to $((Get-HPBIOSPowerProfile -Connection $Con).HPPowerProfile)"
Write-Output "$ScriptName - HP PowerRegulator is set to $((Get-HPBIOSPowerRegulator -Connection $Con).HPPowerRegulator)"
You can run the script as PowerShell script in the Task Sequence, or run it as an Application. I prefer to use it as an application since it then can be controlled using rules. Here you can see the Quiet install command in the application. This command will execute PowerShell and feed the script with Property HPPowerMode (that needs to be FullPower or TreeHugging). 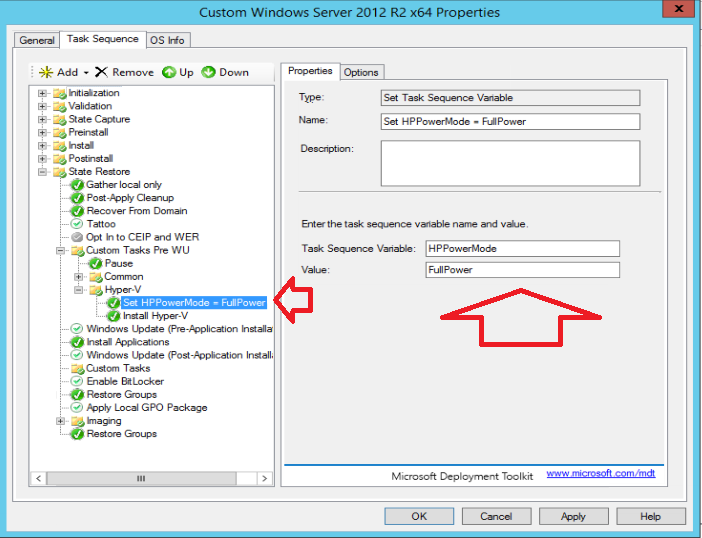 This property can be set in CustomSettings.ini or as step in the Task Sequence. Here you can see the Set Task Sequence Variable HPPowerMode set to FullPower. The actually configuration will be done during the Install step, since it is an application in my case. but it is possible to run the app directly after the Variable has been set. The log file shows the settings.